The reference of real-time multiplayer Belote dedicated entirely to meeting and competition. This Belote game comes with a Coinche game also popular. Exoty.com offers more than 100 000 daily players, a unique Belote game experience on iOS! Dive into the heart of a game that feels good summer with its tropical atmosphere and its thousands of players from player around the world! The most from your online multiplayer Belote and Coinche game, it’s the meeting! You discover affinities with other Belote players, and share - why not - hours and hours of discussion around a Coinche or Belote game. Both variants of the most popular card game are available: Belote Classic and Coinche. The official rules are used. Beginner or very confirmed player, you'll face players of your level in real time at any time of day or night. A training mode is also available to warm up before facing real players. Join the Arena regularly and challenge the best belote players. The rules of the tournament are simple: accumulate victories in a row to win the jackpot of chips. ● The wheel: Rotate the wheel once a day to try to win up to 1000 chips. ● The Totem: Watch videos make you to earn chips. ● Friends Gifts: The more you have friends, the more you will receive chips. The chat is the meeting point for Belote and Coinche players. Express your ideas, your thoughts on your last game and meet new people, find the right partner or opponent to start the game. The chat also allows you to chat privately with a friend and arrange a game with him through the functions "challenge". Customize your avatar to infinity: classic, eccentric or looking exactly like the you, you choose what you want to look like. Stay tuned for news that we regularly, to always give a touch of originality to your avatars. For ease of use, offer and receive in-game surprises from a wide selection of cocktails, petit fours or appetizers. 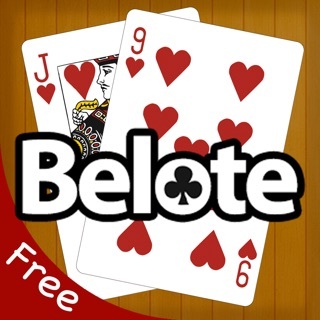 You can play Belote and Coinche game on any device: mobile, tablet or computer and with a single account. Help us to improve and evolve the game, we are available via chat, Facebook page or email (support@exoty.com) to also guide us and we will answer ALL of your questions! Thank you for choosing Exoty Belote! To improve your experience we regularly improve the application. In addition to fixing a few small bugs, discover the Piggy Bank! The principle is simple, the more you play more Piggy bank is going bigger. It's up to you to decide when to break it! Did the people who created the game ever play belote? 7 cards of the same colors in one hand and in many different games? A joke! Les gens qui ont créé ce software ont-ils déjà joué à la belote? 7 cartes de la même couleur en main dans plusieurs jeux différents? Une plaisanterie! It can be the best app for belot but.. PLEASE add declarations in the game like real belot and coinche. Add teirce, quint, quarte, 4 of a kind, no triumphs, all triumphs. If all those become added it will be perfect!